I had been collecting parts for a 9cm transverter for a while, when John G8ACE offerred for sale a DB6NT working 9 cm transverter unit.I already had an the Ionica 15 W PA module but when a number of Airspan 3.5 GHz WiMax unit appeared on Ebay I could not resist buying one just for the two 20 Watt 12Vdc power amplifier units inside. 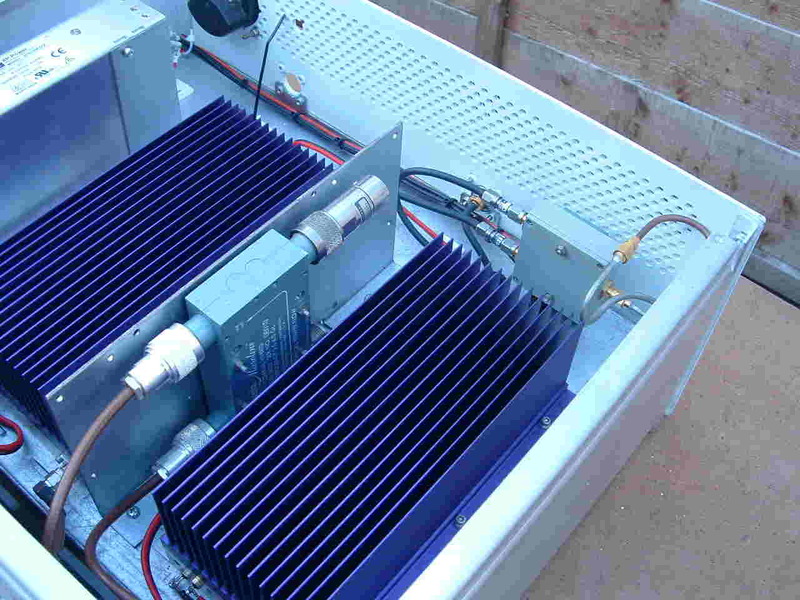 Since I was not planning to masthead mount the transverter I opted to mount the DB6NT unit in the Airspan Chassis. The two PA modules with 240Vac/12Vdc 20A power unit occupy the top of the Airspan box, I have left this unchanged save to remove the two TX/RX diplexers. The underside of the chassis contains the RF and baseband processor PCBs which I have removed.The DB6NT unit, TR/RX sequencer and 28Vdc convertor (c/o relay supply) are mounted on a sub plate.Three 12 Vdc fans are fitted to the rear panel, they are wired to be continously running. They are quite noisy, bolted directly to the metal panel and with a only a mass of 4mm holes for the vent. Mechanically this could be much better. 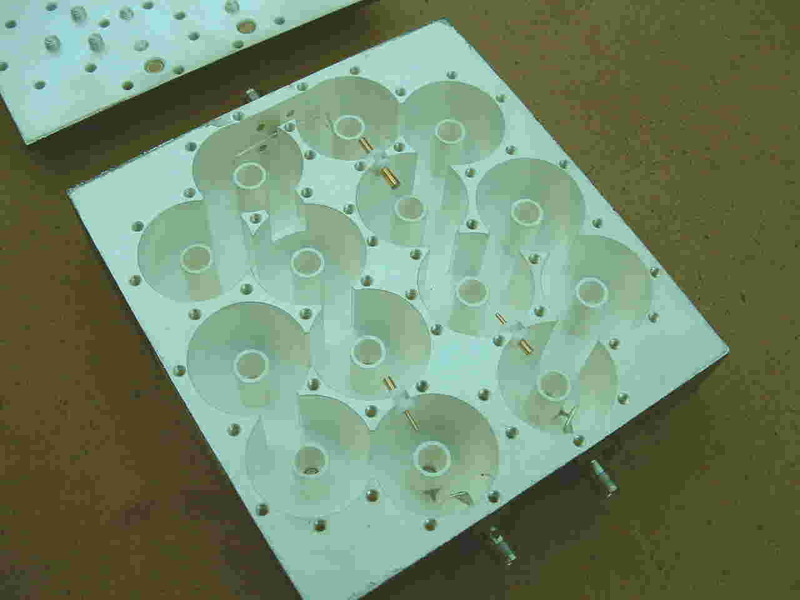 I also plan to have the fans driven from a temperature sensor and interlocked to the PTT control. The Airspan box is 19 inch rack mounted format and could be a bit smaller but it has nice RF sealed top and bottom covers, so I decided not to modify the box but to only cut off the sticking out sides of the front panel. A word of caution here as the front panel (aluminium) has a stick on plastic face which I thought I would remove. It took quite a bit of effort to pull the plastic from the metal but worse it took nearly 3 hours and a lot of cellulose paint thinnners to remove the thick sticky adhesive. What is worse, is removing the sticky mess from the hundreds of air holes in the panel, use the blunt end of a drill bit to poke it out. I planned to get the unit on air with just a single PA connected. Each amplifier has it's own intregral RF ouput isolator. After a considerable time delay, (9cm has been one of my longest amateur radio projects ever) I found on Ebay a Mini Circuits 90 degree hybrid splitter and eventually a Narda 90 degree high power coupler to combine to two amplifiers together. The PA input coupler is fitted with two 3db SMA attenuators, one in each input leg, OK I could have fitted just one in the input but two after the hybrid improves the amplifiers isolation. Performance; The DB6NT unit gives 170mw saturated power output which is far too high for the PA module drive. There is 3.5 dB hybrid loss and a total of 23 dB additional fixed attenuation between the driver and PA modules. The measured saturated power output of each Stealth amplifier is 27 Watts and the measured saturated output of the combined pairs is 45 Watts. 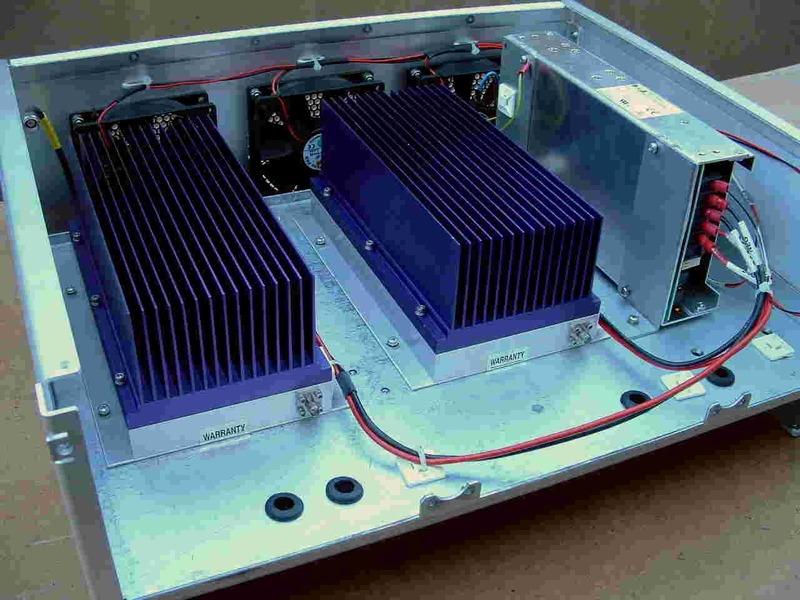 The Stealth amplifiers require just a single 12V dc supply and are very easy to use, the only down side is that they are class A and thirsty on power which is a bit of an issue for portable use on a car battery. 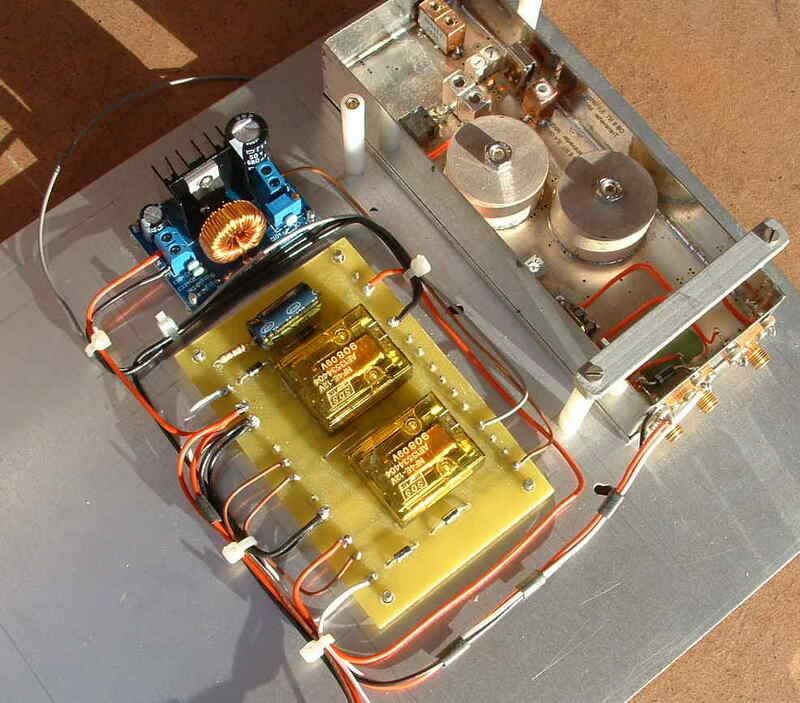 The diplexer can be tunned un-modified to 3400 MHz with a very sharp low frequency cut off, HF is a bit lumpy. Looking at the internal layout it is clear that there is some coupling elements which bypass some of the cavities.Cutting the diplexer in half to just leave the Tx sections would produce a very respectable filter.